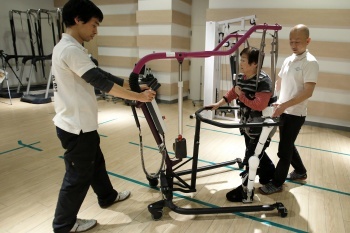 Neurorehabilitation, especially for gait, requires a lot of time and physical effort from Physiotherapists. Often requiring two or more people to assist with initial stages of ambulation. This limits the amount of patients that a Physiotherapist can treat, while placing economic burden on health care. Although initially expensive, robotics provide therapists with the possibility to save time, physical effort, and help more patients. Some ways in which robotics can help are: monitoring and controlling movement speed, direction, amplitude, joint coordination patterns, and controlled perturbations; providing weight support with minimal exertion; and offering the potential for more reliable, standardized tests and goniometry measures. 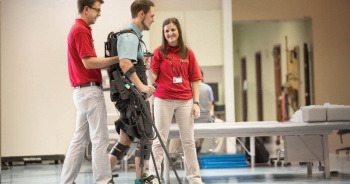 Outside of the physical rehabilitation clinic, robotics is showing promise as an assistive device in the form of lower-extremity exoskeletons or Robotic Hip-Knee-Ankle-Foot Orthoses (RHKAFO). This is a relatively young field with much potential. For information regarding the use of robotics for the upper extremity go the Physiopedia page for Upper Extremity Rehabilitation using Robotics. 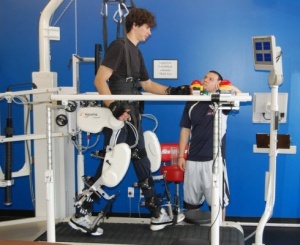 Gait training is one of the most obvious implications for lower limb robotic rehabilitation. With current methods of improving gait, multiple therapists are necessary to help the patient move each joint and leg appropriately to get the greatest benefit. Not only is this an expensive and subsequently unrealistic approach for rehab, it is also extremely labour intensive for the therapists to provide this care. With the use of robotics, less therapist attention is required to deliver the same mechanical therapy. With the patient strapped into the robotic device, the therapist will only need to provide supervision and the setting up of the device. This may help teach the patient proper technique with walking right from the beginning, thus avoiding improper gait patterns. Robotics can also be used in improving and determining a patient’s proprioception of their lower limbs. Once the patient’s eyes are closed, the machine can be set up to move a patient’s limb into a position. The patient is then asked to think about the limb’s position and match it to that of the machine. This helps the patient to focus on the positioning of the limb and place the opposing limb in a similar position. The detection of minor passive movement with a limb can also be tested with robotics. Again with the patient’s eyes closed, the strapped-in limb is moved slowly and gradually with the robotics. The patient speaks out once he/she feels the limb has begun to move. This will determine how much movement is required for the patient to feel. Not only can this be used for a sign of treatment but also for a precise assessment tool. While these are only some of the implications of robotic therapy for lower limb rehabilitation, the robotics industry is a growing field that has many opportunities to improve patient care. With time and research, implications for the robotics industry on lower limb rehabilitation will continue to develop. Rewalk has 2 Models: A rehab model for use in clinics and a personal model for ambulating in the community. ↑ 3.0 3.1 3.2 Díaz I, Gil J, Sánchez E. Lower-Limb Robotic Rehabilitation: Literature Review and Challenges. J Robotics. 2011;2011:1-11. ↑ 4.0 4.1 Maggioni S, Melendez-Calderon A, van Asseldonk E, Klamroth-Marganska V, Lünenburger L, Riener R et al. Robot-aided assessment of lower extremity functions: a review. J Neuroeng Rehab. 2016;13(1). ↑ Harwin W, Patton J, Edgerton V. Challenges and Opportunities for Robot-Mediated Neurorehabilitation. Proc IEEE. 2006;94(9):1717-1726. ↑ Mehrholz J, Pohl M. Electromechanical-assisted gait training after stroke: A systematic review comparing end-effector and exoskeleton devices. Journal of Rehabil Med. 2012;44(3):193-199. ↑ Laut J , Porfiri M & Raghavan P. The present and future of robotic technology in rehabilitation. Curr Phys Med Rehabil Rep. 2016;4: 312.